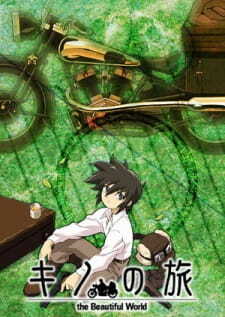 Prequel: Kino no Tabi: Nanika wo Suru Tame ni - Life Goes On. Ok, so this will be my first review for MAL. I've written for other resources but haven't done so for a while, so bear with me. I've recently finished this anime, and I can say I am still surprised. Although I heard rumors that this was something really good, I tend to be skeptic and so I was caught of guard. Why? Let's start with the story, which tells of the journey of a traveler and his motorcycle, while they visit a long range of countries or just meet someone on the way. The actual fact is: there isn't one sole story but 12 short stories that link together not by episode order but by events. And yet the fact that each one of this stories manages to be deeper than whole plots from many animes amasses me. Each episode approaches a theme of society, like censoring, violence, communication problems, right or wrong, the ability some people have to bite the hand that just fed them, and so on. And at every time I found myself smiling in front of the screen while realizing how superbly intelligent each of the episodes plot was. In resume, each of them is really well constructed, some exceeding the others, and you need &quot;keen eye&quot; to get every aspect of them. There is a wide range of characters as expected from an anime that tells about travels over a world. While some of them are forgettable, some of them also stay in your mind. But the fact is, they are there to be a supportive role to the main character, Kino, and this is why my rating in character was high. But before that let's look at Hermes. Kino's travel companion. A Motorad, in short a motorcycle that talks. While I found this odd at first I grew found of the bike. He (it's a machine but I will refer to him as &quot;he&quot;) usually asks a lot of questions to which the main character responds enigmatically most of times, he his kino's closest thing that can be called a friend and it's interesting to see how they interact. It was an interesting choice for a supportive role. Finally, Kino. Kino is the best character I've seen in a while and one of the best overall. I can't think of any character to make a comparison because I don't remember ever seeing a character like her. Calm, intelligent, skillful, sometimes unreadable, extremely wise for someone so young and still as capricious as a child could be. Though not fond of killing, will do so if necessary without felling remorse. An unique character that I enjoyed to watch throughout the whole anime, and if considered alone would deserve 10. Animation wise, Kino's Journey is extremely solid. It kept the art quality throughout the whole anime, something I praise. Although the majority of supporting characters have an ordinary design, this being the downside, some of them exceed in this aspect. As does Kino. Movement is very fluid, each frame seems carefully drawn and the backgrounds are outstandingly well donen also. One thing I thought interesting and enjoyed was thing the interlaced video. Which gives the anime a different feel from any other. As for Sound, voice actors do a good job in overall, Kino's VA does even better. The background music is practically inexistent, this would be thought as a bad thing, but in this particular case it is not. Not even once in the whole series did I fell it lacked music in any situation. It's &quot;almost&quot; absence gives the plot an even more serious look, keeping views attention more centered in it, while using sometimes a tone from a single instrument to denote a particular scene. Lastly the opening and ending theme. In one word, superb. They fit Kino's Travels like a glove. The opening theme has become one of my all time favorites and the ending is very good as well and it's actually performed by Kino's VA. Overall Kino no Tabi is very artistic, intelligent, surprising, and approaches a variety of themes, that always create discussion withing societies in a cold and sometimes brutal way, that leaves you glued to the chair with eyes fixed on the screen, and perhaps like me smiling unconsciously as I joined each plot line realizing how intelligent they where. Do not wait long to watch this. The only people to which I wouldn't recommend this, are perhaps to a younger audience or people who don't enjoy to think much during an anime. That was long :). Well if you read it through, feel free to give me feedback. It's all ways good to improve this or further reviews. Kino's Journey is a collection of societal parables, told through the eyes of a wanderer who visits countries and observes them. Kino, the main character, takes a somewhat prime directive stance toward the civilizations, although she is sometimes coaxed to interfere out of compassion. The show is a collection of parables, and as such, the societies it portrays are exaggerated portraits of a certain societal trait. It's possible that some viewers will feel as if they're being beaten over the head with the moral on some of the episodes. As for me, I thought that it was refreshingly straightforward, and had no problem accepting it for what it was: a story. Although the show is frequently dark, exploring the depths of mankind's ruthlessness and stupidity, there was a core of hope to the show. A message that, looking out at the world around us, and looking in at human resilience in even the worst of societies, you can't help but have hope for the world. Excluding the few actiony episodes, the show generally keeps a slow, contemplative tone, and a pace to match it. I imagine that this will lose some people who are looking for something faster and with more bang. This show is one of my favorites, and stands out as an incredible testament to the power of the medium. This is Kino's Journey? I'd rather stay at home. What many people believe to be a great series, Kino's Journey is a collection of short stories revolving around different countries, customs, traditions and beliefs. The main character Kino travels to these countries with her talking motorcycle pal Hermes, and together they observe the world through outside perspectives. In fact, its almost as if Kino is nothing more than a representation of the viewer. Kino does nothing but observe....ever. She never interferes or judges or saves, when she so easily could. She does nothing but watch the people of these countries act like morons, much like the viewer is forced to. Due to this, unfortunately the feelings of helplessness and despair sets in and gets comfortable for the entirety of the series. I was amazed at the stupidity of it all. I get the concept...we're supposed to feel like nothing can change these awful, horrid events...we cannot change the way of the world. We're about as powerful as a traveler with no soul or heart, but how does that translate into entertainment? All it did was frustrate me. For example...Episode 5, Kino and Hermes meet 3 old dudes that have all been working about fifty years...One is polishing old tracks and making them sparkle. The second is dismantling those tracks piece by piece. The Third? Well, he's repairing the tracks! Kino meets all three and says not one word to any of them of the futility of their efforts and lives. Worse than that, the twelfth episode had two countries at war massacring a third to decide the winner! BY POINTS! Kino, however, shows glimpses of humanity both in her past and towards the end of the series. She does not seem adverse to murder (she kills at least five people throughout the series) and yet she shows a tiny fragment of pain and loss when someone she connected with on a few levels dies (due to an irrational decision to get melted rather than move). These moments are brief, scarce, and quickly forgotten when she hops aboard Hermes and rides nonchalantly towards the next country. Kino's Journey disappoints on plot, but what really stood out to me was the animation. At first, I dismissed the art with the feeling that it was "too kiddy". As the series progressed, the style grew on me and by the end I came to enjoy the "differentness" of it. That is a matter of taste though, same with the soundtrack, which was repetitive and inconsistent at the same time. The opening and ending songs were enjoyable enough, but the few tracks within the show itself often took away from scenes as much as they added in spots. In the end, I did not enjoy Kino's Journey. The series frustrated me and did not make me feel at all like there might be hope for ANYONE in that world. Actually, there was one happy story in the span of 13 episodes, but among all the death and despair, I had forgotten it. I couldn't, in good conscience, recommend this series to anyone looking to anime for an escape or an enjoyable experience. What do you say about an anime that is just about a traveler, journeying to different countries on the back of her talking motorcycle. Sounds boring, right? WRONG!!! This episodic anime, through odd little stories and dialogue, actually explores different aspects of human nature, in one of the most unique ways I have ever seen. There is little to no character development, but in this kind of story, there is no need. There is one episode that gives the back story to Kino, and that was enough. The different countries Kino visits, and the people Kino encounters will make you cry, will enrage you, and at times disgust you. But, while it's making you run the gammit of emotions, it will make you stop and ask "What if?" The episodes each have great lessons to teach, without throwing propoganda in your face or preaching to you.